I recently attended my first Blessingway ceremony, honoring my husband’s cousin Kate, who is my daughter’s Godmother. When first reading about the ceremony, I thought it was going to be a really weird, hippie type of event. The truth is, this is not your average “baby shower.” It’s an intimate moment shared with a select inner circle. In this case, that included mostly breastfeeding moms and lactation consultants who are Kate’s colleagues. I was the only formula-feeding mommy in attendance, but we all had one thing in common: a love for our babies. All attendees were instructed to bring the following items, as listed below. 1. Centerpiece offering. This is an item from your matrilineal line which each attendee will place on the center table (you take it back at the close of the party). It may be something that your own mother or grandmother gave to you at some point or when you became a mother yourself. 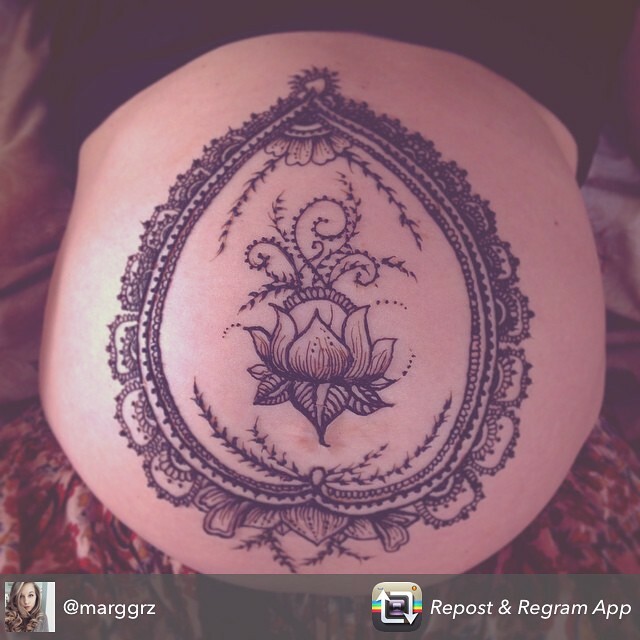 Or, it can be something that the mommy-to-be would recognize, which signifies something special about your connection to her. 2. A bead & a blessing. Bring a special bead and write a small blessing or wish for the baby. The beads are strung together into a necklace for the mommy to wear when she is in labor. 3. A freezer meal. One of the most valuable things a new mother can receive is nourishment from those who love her. Each guest was asked to bring a freezer meal. We all know those come in handy during the first days home from the hospital! 4. Contribution to a cloth diaper fund. Kate’s going for it this time. Props to her. I could never! 5. One copy of our family’s favorite kids book. This was easy. I bought a book on animal farts and a Berenstain Bears New Baby book for Kate’s son. The event began with everyone seated around a table that was dressed with all the matrillineal contributions. These included jewelry, family photos and books. A candle was lit and someone (who didn’t shave her armpits, hippies I told ya) walked around the room with burning sage to cleanse the space. Everyone introduced themselves and shared a memory about the mommy-to-be. Then, they read inspirational readings and blessings. At one point, everyone held out their wrists and someone went around with string, connecting us. 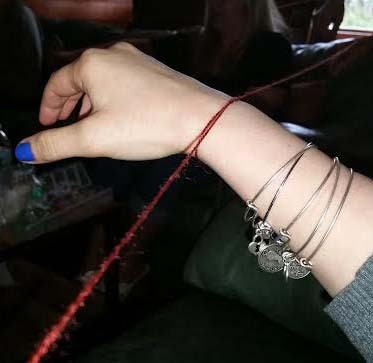 The string was cut and we each tied a piece into a bracelet that we are supposed to wear until Kate goes into labor. As favors, we were all given candles and instructed to light them when we get the text that Kate’s on her way to the hospital. It’s a way of showing support. She also did a belly cast and decorated it with seashells. Overall, yes, this was little off the cuff. But it was a very special event and I was honored to be a guest. 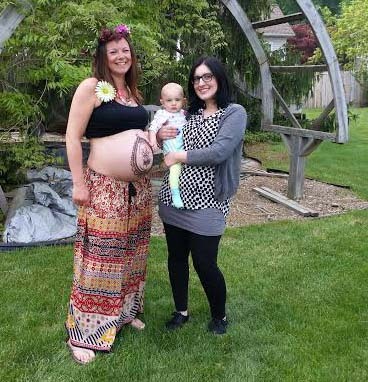 Mother’s blessing ceremonies are ideal for second-time moms like Kate, who don’t need a ton of registry items. It’s not something to which you’ll invite every friend or family member. It’s a time to bond over motherhood and to take a moment to reflect on all you’ve gone through in pregnancy and birth and all the joy that lies ahead. If Sprinkle Showers aren’t your thing, consider a Mother’s Blessing.